It’s nearly ready. And we think its a first in Denver. 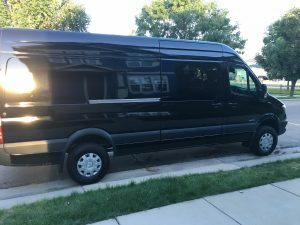 As far as we know, our 14 seat Sprinter will be one of the very few the only Denver based 4×4 Sprinter operating in our market. That means maximum safety and traction when the snow and ice arrives. And it means sticking to our company philosophy of all vehicles being all wheel drive or 4 wheel drive. Our Sprinter will also run Blizzak winter tires in winter. Just like every car that we operate does. 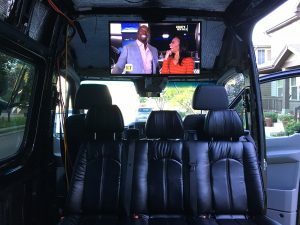 Our new Sprinter is going to have blisteringly quick dual network wifi onboard (same system used in many police cars), a plethora of entertainment options, you’ll have 110-volt power at each row of seats, and USB ports everywhere (to keep your phones charged). We weren’t happy with the standard seat offering so we found a specialist seat manufacturer in Indiana and ordered the ones you see. Much more comfortable for the trips to the mountains. We’ve added additional insulation to the roof and walls, added ceramic tint to the windows to reduce heat and glare, installed a separate heating and cooling system for the rear, and added a second heavy duty battery plus a 1000w inverter to run all the electrics.